Craig Levein has made three changes from the side that drew with Livingston in midweek for today’s William Hill Scottish Cup tie against Auchinleck Talbot. 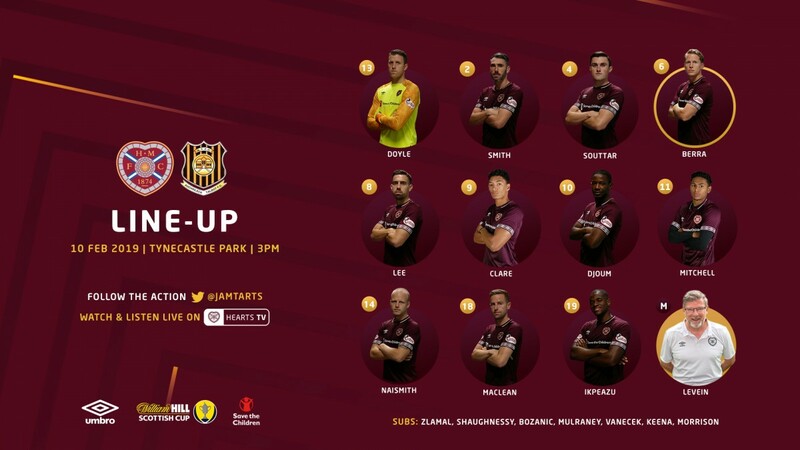 Uche Ikpeazu makes his first start since October after spending four months out through injury, and partners the retuning Steven MacLean up front. Demi Mitchell is also handed a place in the starting line up, with Conor Shaughnessy, Oliver Bozanic and Jake Mulraney dropping out. Doyle, Smith, Souttar, Berra, Lee, Clare, Djoum, Mitchell, Naismith, MacLean, Ikpeazu. Subs: Zlamal, Shaughnessy, Bozanic, Mulraney, Vanecek, Keena, Morrison.